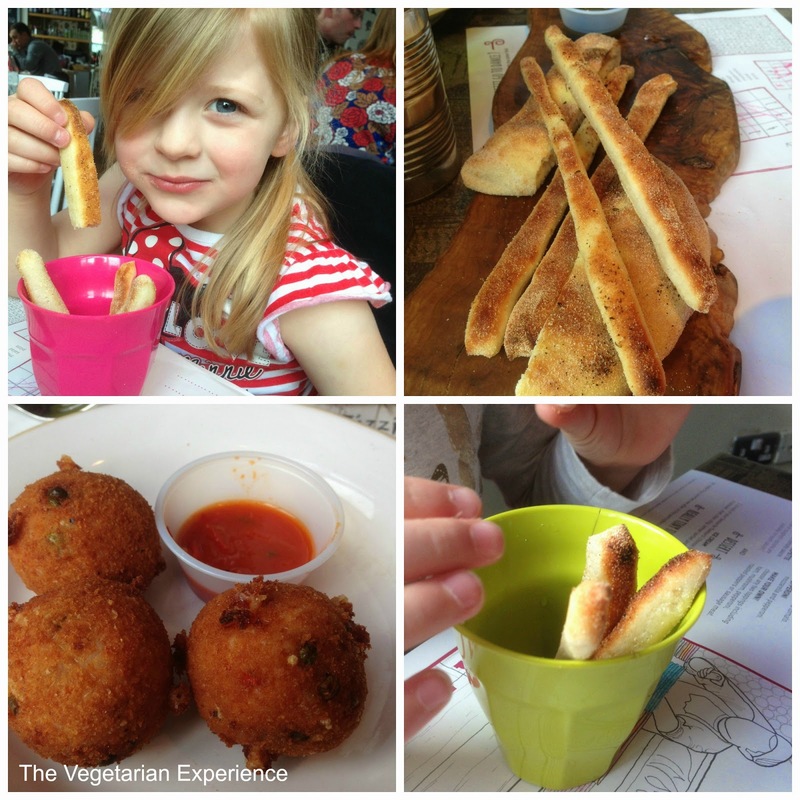 Recently the family was invited to review our local Zizzi restaurant in St Albans. Zizzi's aims to provide affordable Italian food using fresh, local ingredients. Founded in 1999, there are currently one hundred and twenty six Zizzi restaurants in the chain across the UK. We have visited our local Zizzi restaurant previously on a few occasions and always had a good experience. I absolutely love the decor and the feel of the St Albans restaurant. It feels really bright and airy, and is also very family friendly, so parents can relax during the meal. On the Saturday that we visited, there was a great atmosphere as it was quite busy with lots going on. Upon entering, we were quickly shown to a table, and sat down to browse the menu. The kids were also provided with colouring implements to keep them busy during our time there. The range of starters and main courses on the menu is quite overwhelming, there is lots to choose from - especially for vegetarians. Options for vegetarians included a butternut squash salad, pomodoro spaghetti, and several pizza options. There were also lots of choices from the starter menu too which were vegetarian friendly. The "Bambini" kids menu consists of three courses and a chocachino for £6.75, which is great value. The kids chose dough sticks to start. The Dough sticks came in a kiddy friendly cup, which the kids loved. They could choose a mini pasta option, or a mini pizza with toppings for a main course, and ice cream for dessert. Mine chose pizza with their own preferred toppings and then ice cream for dessert - chocolate and strawberry. They also relished their chocachino (steamed chocolate milk) at the end of their meal. They thought that the menu choices were fantastic and both kids (aged four and seven) had no trouble in finding something to eat. Their meals were also served first, which I really appreciated as it meant that they could tuck in and were not interrupting our meals. Serving the kids meals first is a big plus in my book, and something that I wish more restaurants would take notice of, as children are not as patient as adults. The kids meals were also cooked from fresh and used good quality ingredients, and it was lovely that it wasn't the usual microwaved pasta and unhealthy chips so often found on other menus. Both hubby and I opted for the Arancini as a starter - deep fried risotto balls made with mozzarella, pea and a breadcrumb coating. We were both so impressed with our starters as they tasted really delicious. I would have liked a tiny bit more of the sauce, as it ran out fairly quickly, but it was a fairly minor niggle as the taste of the Arancini was so satisfying. I have to say that the service from out waiter was genuinely the best service I have received in a very long time, and we eat out a lot. However, I don't know if this is just because they knew that I was reviewing the restaurant, but I don't think it was. The excellent service came down to the little things that can be so frequently forgotten in some restaurants - clearing napkins and dirty cutlery and glasses in-between courses, bringing fresh cutlery for each course which is a big plus in my book, and clearing dirty glasses and bringing fresh drinks when required. Our waiter looked after us really well and I was seriously impressed. For main course, we both chose pizza's. I had the "Pizza Rustica" - Zizzi's signature pizza which is hand stretched for a bigger base, crispier texture and more toppings. I chose the Primavera Rustica Goats’ cheese, aubergine, artichoke, peppers, olives, mozzarella, green pesto and rocket on a wholemeal base. The Primavera Pizza was very eye catching and looked really appetising. It also tasted really delicious. The combination of ingredients blended really well together, and the pizza was very filling as a main course. I enjoyed it very much. Eldest opted for a Margherita pizza which she enjoyed. For dessert, the kids had their ice creams. I opted for "Kitty's Gelato" in Strawberry, Mint Choc Chip and Vanilla. Hubby went for the "Espresso Affogato" - a classic Italian dessert of crema gelato and mascarpone cream, organic espresso and amaretti biscuits. Every item was served individually, to enable hubby to create the dessert in the way that he wanted. He enjoyed this very much and the taste of the dessert was very impressive. I have to admit I did steal some of his as it was so delicious. I know what I am having next time! 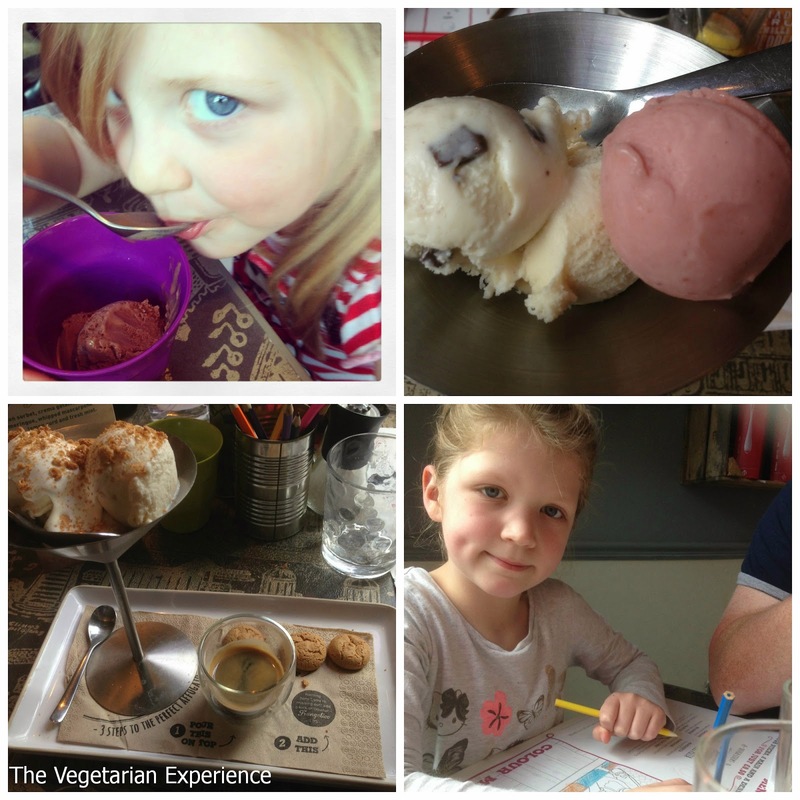 Here is what the kids had to say about their food: "I liked it, it was yummy" (youngest). "The food was really good and I especially loved the dough sticks with oil. I also loved Mummy's Arancini" (eldest). "The food and service was excellent, I thought the decor of the restaurant was bright and vibrant. The menu was good with lots of variety. I would definitely visit again" (hubby). Altogether our meal came to around £70 for three courses and drinks, which for a family of four, I thought was pretty good. Zizzi's is a great family friendly restaurant - perfect for a visit with the kids, but also grown up enough for an evening visit on your own. I would definitely recommend a visit. 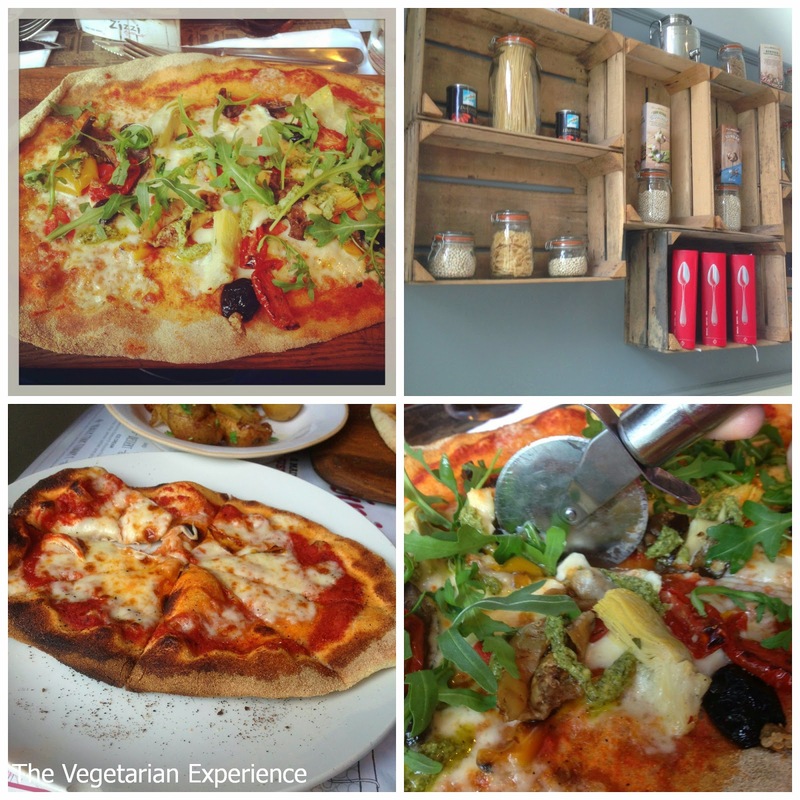 Have you visited a Zizzi restaurant? What did you think? Disclosure: Meal offered in consideration for review.